Teen Titans 4 continues the introductory storyline, giving Damian a chance to look less callous and evil than he has in the first three issues. Now honestly, I sort of like a callous and evil Damian, but this is a team book, and the other members have to have some reason to put up with him. Percy even balances this issue nicely between Damian and the other members of the team. 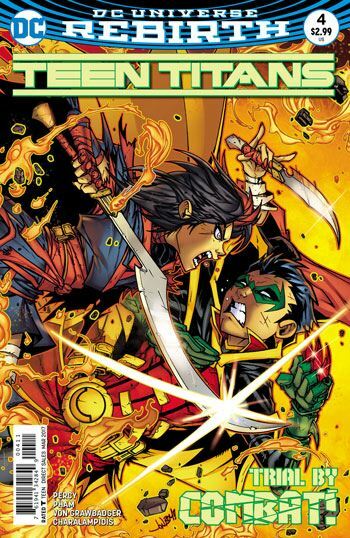 The story opens with Robin turning himself over to his grandfather, Ra’s Al Ghul, and challenging his old “classmates” to a battle to win the safety of the Teen Titans. Beast Boy happens to be trailing along as a fly, and witnesses this moment of self sacrifice. So that enables Beast Boy to reveal Damian’s actions to the rest of the team. While we watch Damian fight for his, and their, lives, the Teen Titans debate what action to take. It’s fairly straightforward, almost formulaic, but the dialogue is good, and the characters are fun. Just because nothing really hugely surprised me does not mean that I didn’t enjoy reading the issue. And though it’s dealt with very quickly, this issue also has Kid Flash, the only one of Damian’s recruits who had not been part of any previous line up of Titans, come to feel that he truly is a member of the team. I expect this will get touched on again, and not too far down the road.